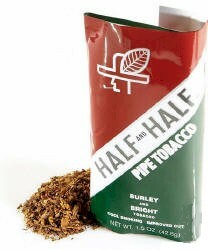 Half and Half Pipe Tobacco is a Burley based pipe tobacco made in the USA. 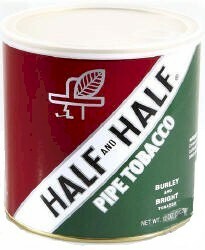 Half and Half Pipe Tobacco smoothness, flavor, and the perfect touch of aroma, that's Half and Half pipe tobacco. This timeless blend employs a mellow mixture of loose cut Burley and Bright Virginia tobaccos. The result is a flavorful, easy-going smoke that's buttery-smooth, balanced, and complimented by a hint of cherry in the aroma. You'll want to smoke this one over and over....and at my ridiculously low price, you'll be able to afford it.